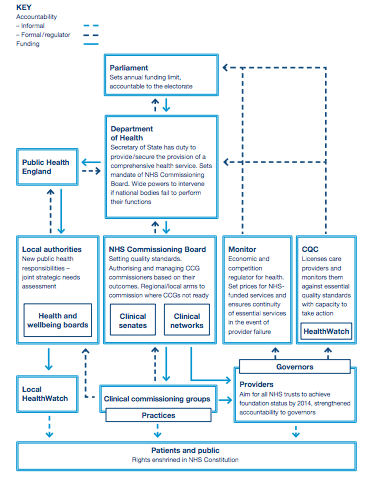 The King’s Fund published the above diagram as part of a report on Good Governance for Clinical Commissioning Groups (PDF) in the new health system. It’s one of the best diagrams we’ve seen so far explaining where accountability lies within the system, and funding. Click to see a full size version. The whole report is worth reading for an insight into what the new groups are supposed to do, and how they are supposed to operate. The King’s Fund also has a section on its website about the NHS reforms covering autonomy, accountability and democratic legitimacy, which provides some useful historical and other context.